I’m always monitoring social media news, so I was pretty excited when Facebook announced a new comment thread feature for business and brand pages. The feature is available to eligible pages now by opting in inside your page’s admin panel. A permanent switchover for all pages is scheduled for July. Regardless if you’re an agent, broker or a page manager for a real estate organization, it’s important to start planning how you’re going to use this new feature to increase your page’s social engagement. Especially because with the launch of Facebook Graph Search, the amount of interaction on your Facebook page will affect your page’s ranking in the graph search engine results. Since audiences and clients tend to always have questions, consider optimizing your use of threaded replies by planning live real estate question-and-answer sessions and chats on your page. To get you started, check out my quick intro to threaded replies and three ways to utilize them for your real estate page. The new threaded comments and replies feature allows conversations on page posts to be organized based on who is talking to whom. That means if you post a link to your organization or business’s latest press release, and a user comments, you can reply directly to them instead of adding your comment to the end of the chronological stream. This helps form more one-on-one relationships and encourages the development of trust between you, your audience and social influencers. Post comments are also sorted by popularity. The more replies and likes a comment has, the higher it will appear on your post. Comments are no longer sorted chronologically. Additionally, a user’s comment appearance order will depend on their social graph. For example, if I’m checking out a local real estate agent’s post, and one of my friends commented on it, I will likely see their comment ranked higher in the stream than a stranger’s reply. Threaded replies are currently only viewable on desktop computers, so that’s important to keep in mind when implementing the following three tips. Make a personal appearance on your page by organizing and facilitating a live Q-and-A session. If you’re familiar with Twitter chats, Facebook threaded replies give you a similar opportunity to directly reply to individual users within the comment steam. 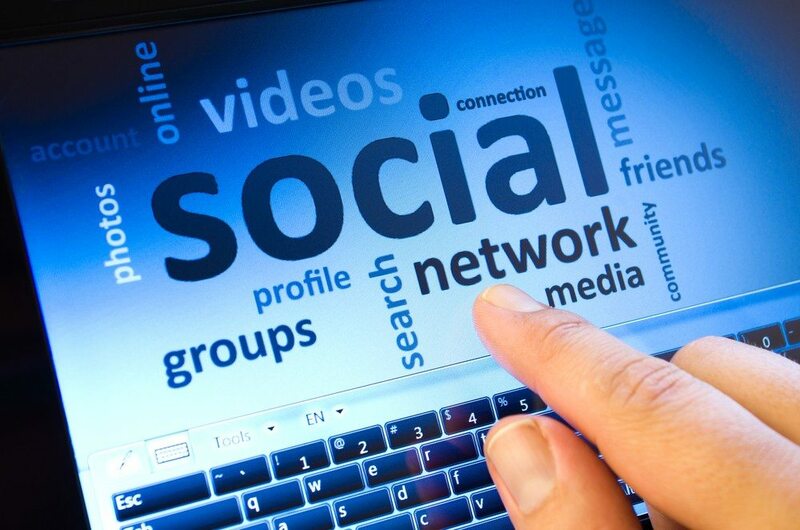 But with Facebook posts, comments and replies, you are no longer limited to 140 characters! When you’re promoting these events, be sure to let your audience know who they’ll be talking to! For a personal agent page, invite your audience to ask you anything about you and your business. This will help current and prospective clients get to know you on a more personal and connected level. If you manage an MLS or an association Facebook page, invite members to ask questions about your procedures, policies and special events. These Q-and-As can turn your Facebook page into a highly valuable industry resource, attracting more community members to join your Facebook page. Similar to the live Q-and-A sessions, threaded replies can be used to launch Facebook chats within your page. You can either schedule these chats for certain days or times, or simply post a prompt that encourages your followers to reply at their own leisure. These chats should target highly specific segments of your page’s fan base so like-minded individuals can interact directly with you (the page manager) and other community members with similar questions, ideas and concerns. These chats can be cross-marketed through your other social networks like Twitter. Individuals considering a career in real estate. Commercial investment buyers and sellers. Residential and commercial property landlords and tenants. Recently licensed real estate agents. From webinars to guest presentations at conferences, guest panels are always popular and are great educational tools. Now you can translate the same concept to your Facebook page. Consider inviting guest industry experts to join a virtual panel on a particular post on your Facebook page on a specific day and time. This tactic is best described as a live Q-and-A and chat hybrid. Guest panelists can comment on posts with their own ideas and thoughts and answer questions from your page audience. Guests are also likely to cross-promote the panel session to their own social networks and peers with a link to your Facebook page. Since the panel will increase your guest’s credibility and drive traffic to your page, it’s a mutually beneficial event! MLS representatives and new agents (to discuss licensing and local policies). Brokers, new agents and experienced agents (this is a great combo for a virtual recruiting event!). These live Q-and-As and Facebook chats are really just the tip of the iceberg when it comes to implementing threaded replies in your Facebook marketing strategy. Still feeling uneasy about using replies? 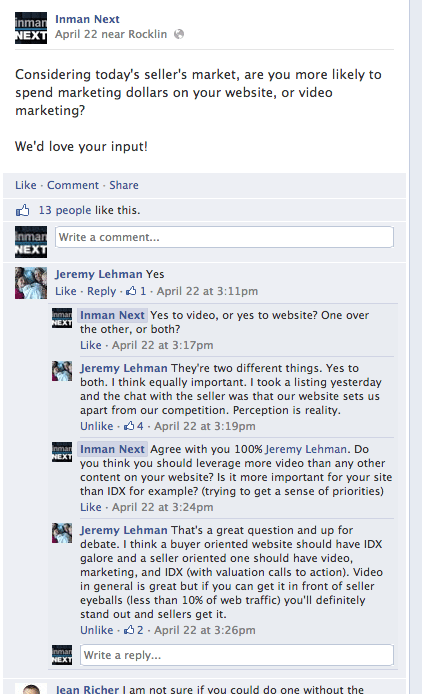 Head on over to the Inman Next Facebook page to reply to others and get involved in the conversation! Katie Elizabeth is a freelance blogger and a social media consultant for WebpageFX, an Internet marketing company. She also served as marketing coordinator for Coldwell Banker Penn One Real Estate in Pennsylvania for five years.